This article was written by David Minton, Director of LeisureDB – base in London, UK. David has 30 years experience in the health and fitness industry, and holds a unique insight and perspective on the developments in the health and fitness sector. David is widely sought after as mentor, analyst, advisor and consultant by a range of worldwide health and fitness organizations and leisure investors. We’re re-sharing David’s article on the zingfit blog as part of our Education and Thought Leadership Series. London’s growth in both supply and demand for boutique studios is the fastest growing segment in the fitness industry. 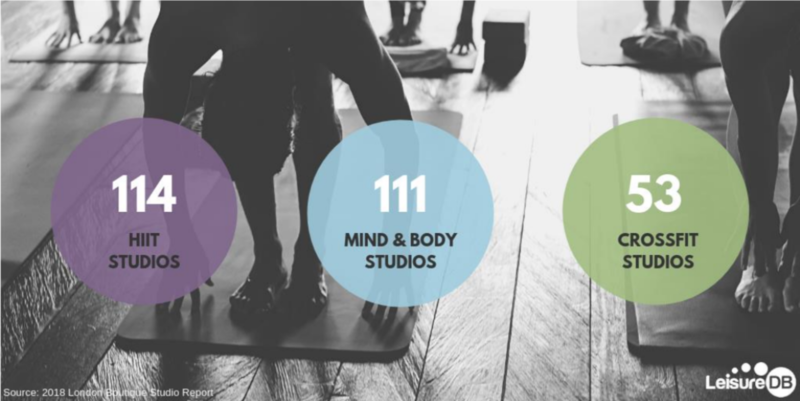 By the end of October 2018, London had 278 boutique sites with over 400 studios offering 15,806 classes each week. The popularity of this segment, which sets itself apart by offering captivating experiences and providing a memorable visit, is detailed in the new benchmark report, “2018 London Boutique Studio Report.” Details can be found here: http://www.leisuredb.com/fitness-studios-boutique. The boutique studio trend should come as no surprise as Barry’s, for example, started in West Hollywood, Los Angeles, 20 years ago and other concepts like ‘spinning’ are even more mature. Boutique concepts are not new; London is awash with cool, hip hotels, bars selling craft beer from microbreweries, wine bars specializing in boutique wineries and there’s no end to the number of baristas adding value to the simple coffee bean. People are prepared to pay a premium to have a story to tell; an experience, to understand the provenance and to be part of a tribe. Boutique studios are cashing in on this movement and the 2018 Report explores the growth since 2011. Details include studio type, number, classes, location, capacity, extra facilities and live links to the social media channels. 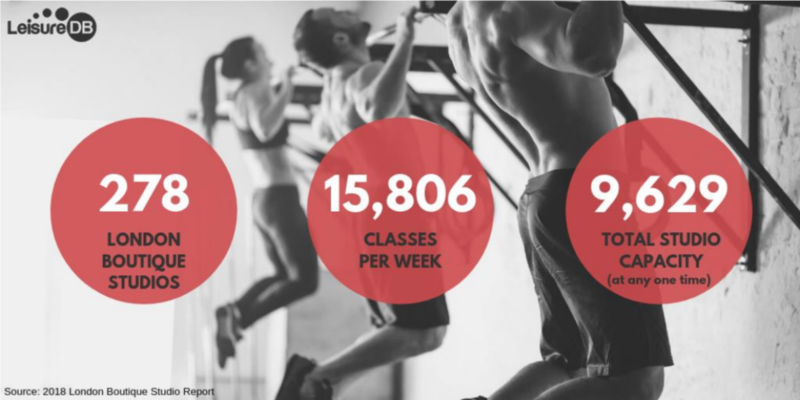 A breakdown and history of the main boutique styles (HIIT, Mind & Body and CrossFit) are provided along with charts showing the number of weekly classes across all sites. This movement couldn’t happen without investment, imagination and some clever mash-up of athletic-wear, fashion, music, some inventive collaborations and design. In London, the investment and co-branding has been on a more British scale with hype and queues to get into classes more muted than NYC and LA. Crowd Funding has helped brands like 1Rebel, BLOK, Core Collective and Boom Cycle, contributing around £10 million towards growth. 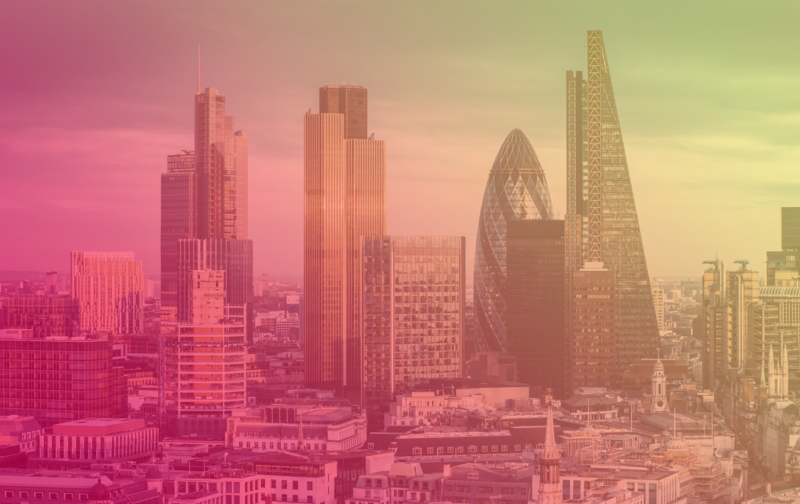 Investment firms like Codex Capital (1Rebel), Piper (Frame), Encore Capital (Another Space) and Pembroke VCT (Boom Cycle) are some of the early investors with around £20 million committed so far. Private investment from former and current professional boxers and fighters, local and international franchise operations plus industry specialists are fueling the growth. Luxury brands are linking with street power brands and collaborations are going mainstream. Louis Vuitton Moet Hennessy (LVMH), who have over 60 prestigious brands, partnered with Catterton, a private equity firm, in 2016. The re-branded “L Catterton” is one of the largest, diversified consumer-dedicated private equity firms in the world. Three of L Catterton’s portfolio of boutique companies are named in “The World’s Most Innovative Companies 2018” by Fast Company. TPG Growth is another red-hot investor in this sector and Mark Grabowski joined in 2016 after leaving L Catterton, where he worked on the Peloton and Pure Barre deals. TPG Capital, the main investment firm, owns a stake in USA fitness gym operator Life Time Fitness which it took private in 2015 with Leonard Green & Partners from LA, in a $2.8bn leveraged buyout. Leonard Green & Partners purchased the UK’s largest low-cost brand Pure Gym, in 2017. 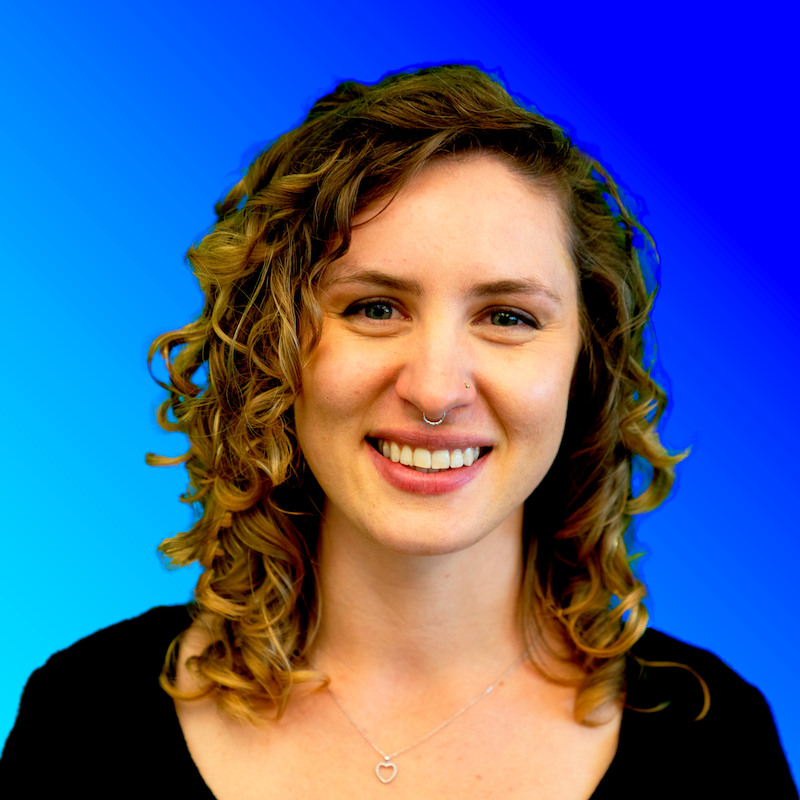 Grabowski has now spun out of TPG, raised his own fund and partnered with Anthony Geisler to buy Xponential with the idea of curating various boutique fitness concepts under one umbrella. The holding company currently has Club Pilates, Stretch Lab, Cyclebar, Row House, AKT, Yoga Six and in 2017 had almost $150 million in revenue. Cyclebar will be the first brand to open next to the new Embassy of the United States in London’s wider Battersea development this year, while master franchises, will be appointed to expand all brands throughout Europe. Hotels and real estate companies have been expanding the boutique concept to include fitness. Hilton Hotels, a legendary name in the hospitality industry, is listed number 3 in the Fast Company Wellness listing for building hotel rooms that double as gyms with its Five Feet to Fitness initiative. Hilton have also installed 6 Les Mills ‘The Trip’ virtual studios in the UK. Hyatt Hotels acquired Exhale, a 15-year-old boutique spa concept with 25 locations, in 2017 to add to the Miraval, a provider of wellness experiences, to deliver wellness to guests. 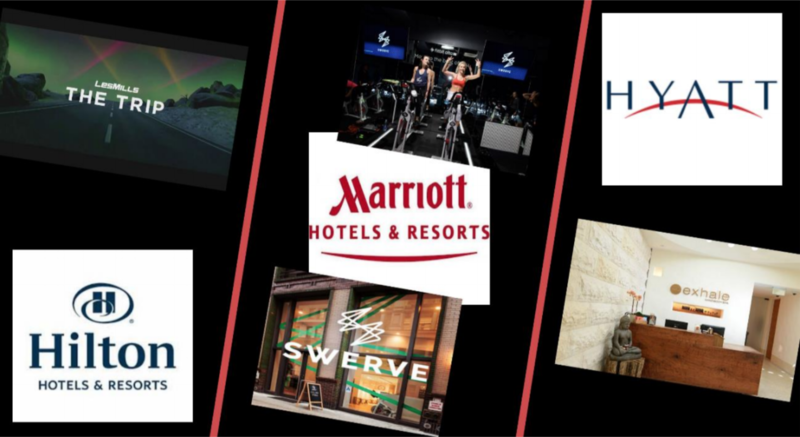 Marriott International own the five W Hotels in NYC and have partnered with Swerve Fitness locations at Midtown and Flatiron. Guests get a Swerve swag bag and unlimited rides during the stay. At Swerve you ride in ‘teams’ (Red, Green and Blue) for 45 minutes of rhythm rides bringing indoor cycling and team competition. This first comprehensive report on the growth of Boutique Studios in London provides unique insight, with benchmarking, into the fastest growing fitness segment. Copies of the report can be purchased and downloaded from http://www.leisuredb.com/fitness-studios-boutique.